Includes medical id tag and free laser engraving! 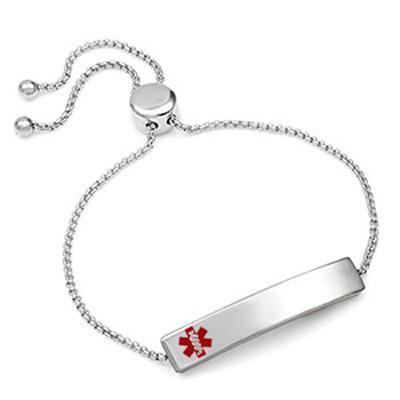 Our SureFit easy on and off slide bracelet with red caduceus medical symbol. Our shimmery box chain fits wrist sizes 5.5 to 8 inches. Engrave front and back of tag with your medical information. 14K Yellow Gold plated stainless steel. No further discounts on this laser engraving product. Bracelet fits wrist sizes 5.5 inches to 8 inches. *Note, bracelet chain will hang longer on smaller wrist size.